Three hockey players from the Miramichi Timberwolves were at Blackville School during Family Literacy Day on Wednesday, January 27. The elementary students wore hockey jerseys to school to celebrate the event. 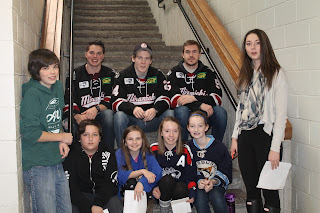 The visiting hockey players were Riley Scott (24), Tucker White (5) and Bobby Dugan III (1). To view more photos from the visit, click here.